If you aren’t getting enough recipes with your current exclusions, consider including foods for which you have good substitutions. For instance, if you don’t care for spinach but enjoy chard, simply substitute chard for spinach in those recipes rather than excluding all recipes that contain spinach. Doing that will help keep your Recipe Box from being as limited. Keep in mind our Top 20 Ingredients list when making your exclusions. If possible, use substitutions for these ingredients rather than excluding them completely. Modify recipes to meet your needs. There may be many recipes that have one ingredient that could be easily omitted or substituted to meet your dietary preferences. To modify the recipe, simply open the recipe card, choose Actions>Modify, and make the changes that meet your needs. Doing this can significantly increase the number of recipes you get in your plan. Click here for more detailed instructions and tips for modifying a recipe. 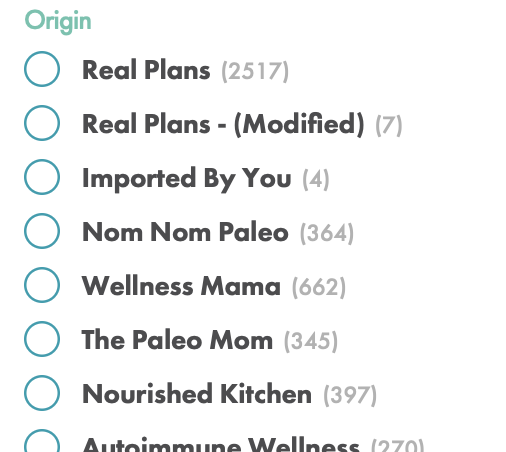 If you have a favorite blogger or know a good resource for recipes that meet your dietary needs, you can easily import them into your Recipe Box to populate your planner. Please visit this support article for more detailed instructions on how to import a recipe. Some diet types are particularly restrictive by nature. For those, we have some awesome contributors that can be added to your plan to give you many more recipe choices. Please click here for a list of our contributors and the diet types they accommodate. For instructions on adding an upgrade to your plan, click here. Still need help? Click on “Chat with Specialist” for help anytime! We are always here to help you get the most out of your meal plan!